Since I had such success with the last Batter Blaster I reviewed, I thought, why not? Let’s try another variety of the stuff and see which one I like best! 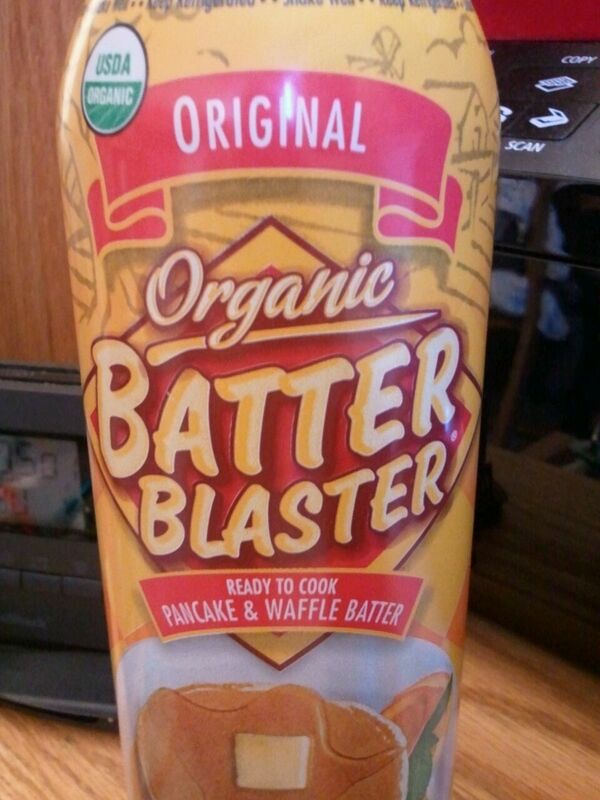 Off to the store, and a friend of mine picked up the Batter Blaster Organic Original Pancake & Waffle Batter for me, partly because she said it was the only option to choose from. Well…that works, including I wanted to try the original variety anyway. This morning post gym, I brewed up some coffee, sliced an apple, and then cooked some egg whites and 1 large pancake (as opposed to 2 small ones as the nutritional information suggests). 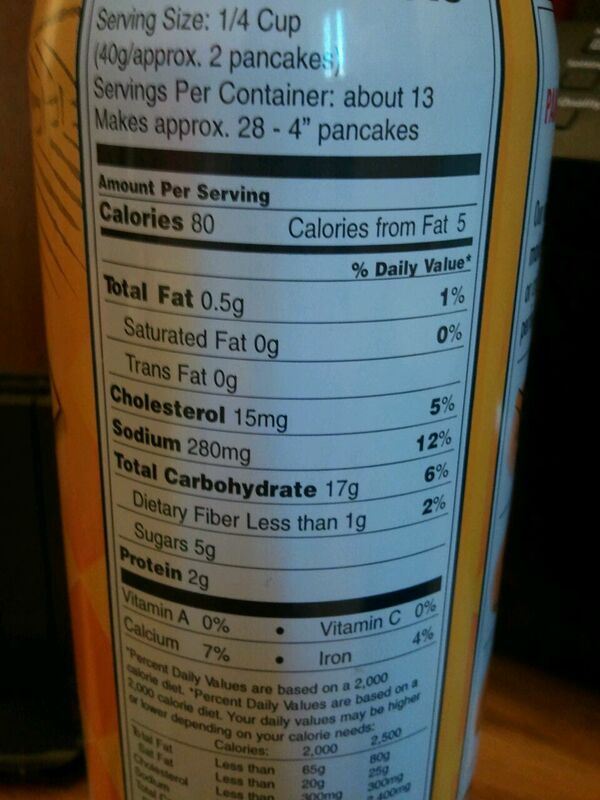 I cooked up the pancake with some butter/buttery spray as I did that last time and found it helped with the flavor. 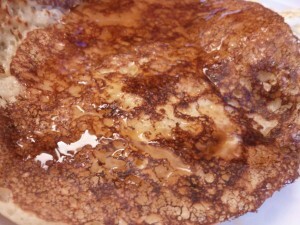 Here’s what my giant pancake (about 42 grams or so of batter) looked like. I made more of a BIG pancake (probably the size of my face) so it cooked quickly and wasn’t super thick. It cooked evenly and all it took was a little non-stick spray and the pancake gave me no trouble at all. Post frying pan, I transferred to a plate with my scrambled eggs and put some SF syrup (would love to use a little of the REAL maple syrup, but I’m a diabetic and have to refrain from sugar!). I tried a bit of the pancake plain first, and well, it tasted just that. Plain, kind of bland, not sweet and not a whole lot of flavor. 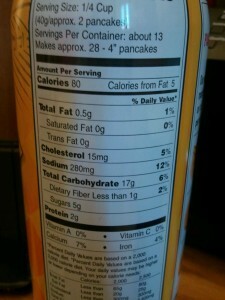 However, I feel like pancakes in general, unless flavored, don’t have a bunch of flavor. 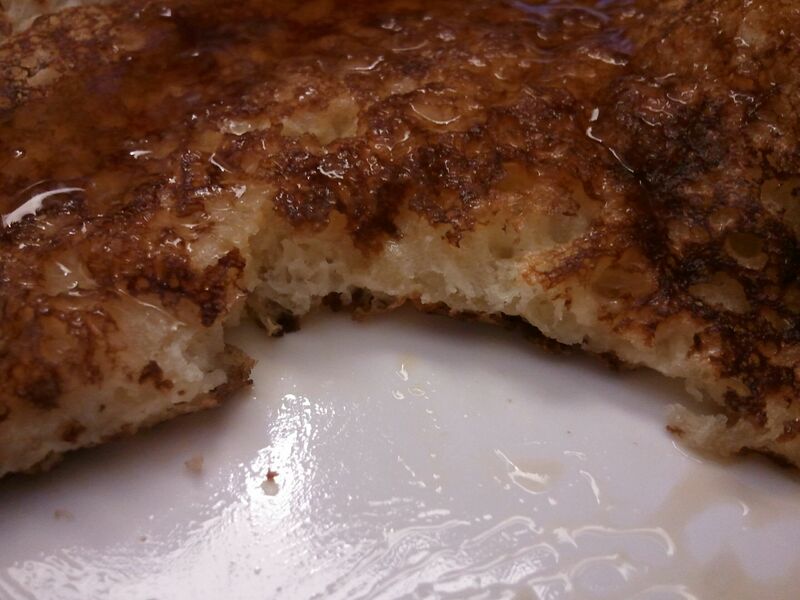 Nothing a little butter and syrup couldn’t fix! With the butter/syrup the pancakes were really quite good. Slightly crispy on the edges, super fluffy, and yummy. They reminded me of IHOP pancakes. Honey Creamy-2 Tbsp is 190 calories, 14 grams of fat, 10 carbohydrates, 4 grams of fiber, 4 grams of sugar, and 7 grams of protein. Roasted Soybeans (Non-GMO), Naturally Pressed Soybean Oil, Maltodextrin (from Corn), Honey, Granulated Cane Sugar, Monoglycerides (derived from Vegetable Oil), Salt. 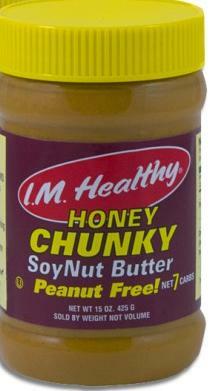 Honey Chunky-2 Tbsp is 170 calories, 11 grams of fat, 10 carbohydrates, 3 grams of fiber, 4 grams of sugar, and 7 grams of protein. Original Creamy– 2 Tbsp is 200 calories, 14 grams of fat, 10 carbohydrates, 3 grams of fiber, 3 grams of sugar, and 6 grams of protein. Roasted Soybeans (Non-GMO), Naturally Pressed Soy Bean Oil, Maltodextrin (from Corn), Granulated Cane Sugar, Monoglycerides (derived from Vegetable Oil), Salt. Unsweetened Creamy-2 Tbsp is 190 calories, 15 grams of fat, 6 carbohydrates, 5 grams of fiber, 0 grams of sugar, and 9 grams of protein. Roasted Soybeans (Non-GMO), Naturally Pressed Soy Bean Oil, Maltodextrin (from Corn), Monoglycerides (derived from Vegetable Oil), Soy Lecithin and Salt. Chocolate-2 Tbsp is 190 calories, 14 grams of fat, 12 carbohydrates, 3 grams of fiber, 9 grams of sugar, and 6 grams of protein. Roasted Soybeans (Non-GMO), Naturally Pressed Soy Bean Oil, Maltodextrin (from Corn), Granulated Cane Juice, Cocoa, Mono and Diglycerides, Natural Vanilla. 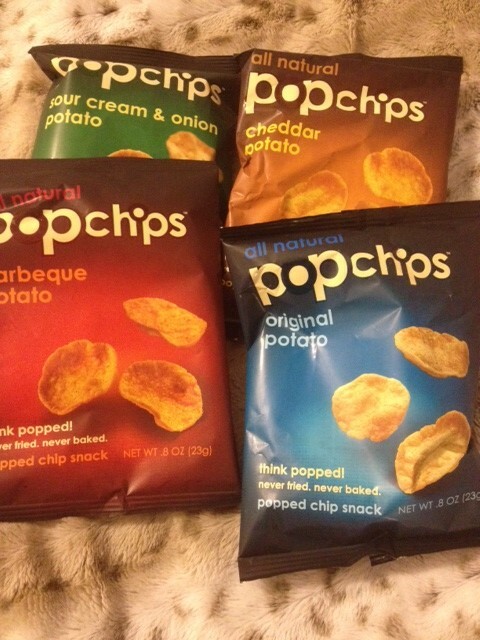 What are Popchips, you ask? 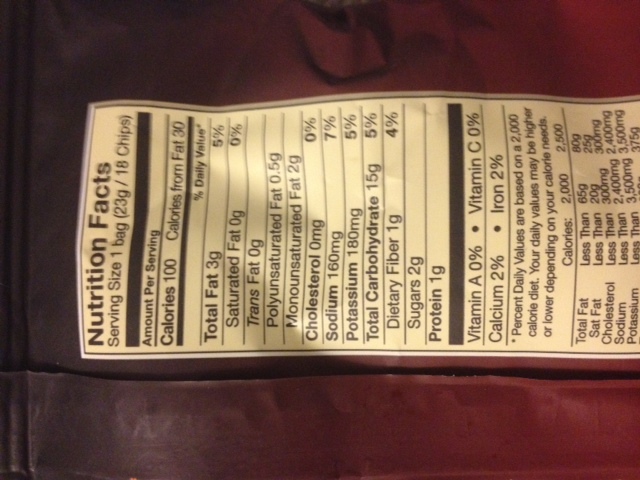 Aside from delicious, Popchips are chips, but they aren’t fried or baked, but rather, according to the website, made with “wholesome potatoes, add a little heat and pressure, and pop! It’s a chip”. They are also relatively low in fat, are all natural, and come in 7 delicious flavors. They are the perfect compliment to your lunch, or eaten directly out of the bag. You can “pop” 😉 them in your purse and take them on the go with the conveinent 100 calorie bag portion too. I was sent a few of the single serving bags courtesy of PopChips! company (thanks guys!). Anyway- :D…without further a due, let’s see how each flavor ranks up! Barbeque- Oh how I loooove Barebeque flavors! This was more of a sweet barbeque flavor, and I definietly tasted a smokey flavor mixed with a brown sugar/honey flavor. It has a wee bit of heat to it too, and left a little burn on my tongue. There was a strong onion/garlic/salty flavor that mixed nicely with the sweeter tastes. It was sort of like a transformation in my mouth- sweet at first bite, then the spice hits! 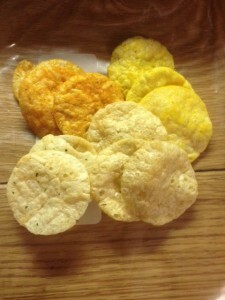 Sea Salt & Vinegar– I had some help with these. I’m not really a fan of vinegar, I don’t even like the smell when we dye eggs at Easter. So, I went to my aunt, and she gave them two thumbs up. I tried one and I thought they were very salty with a very strong, bitter vinegar flavor. But hey, if that’s your style, go for it! Overall, 4 stars. 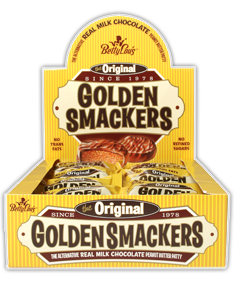 These are really good, and I’ll definitely buy them again. I’ll also feel less guilty serving these at parties rather than Doritos or Lay’s because they are all natural, lower in fat than other chips, and don’t have any trans fats. I also like how the portion size is almost double of a normal portion for chips. 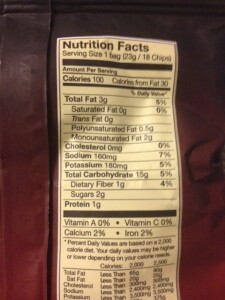 You get about 20 instead of the typical 10-11 chips per serving, and for a few less calories! 1 oz of each flavor (about 19-20 chips) is around 120 calories, 4 grams of fat, 20 carbohydrates, 1 gram of fiber, and 2 grams of protein. Each flavor is made with all natural ingredients. The following is just for the original. If you’d like to see all the flavors, click here. 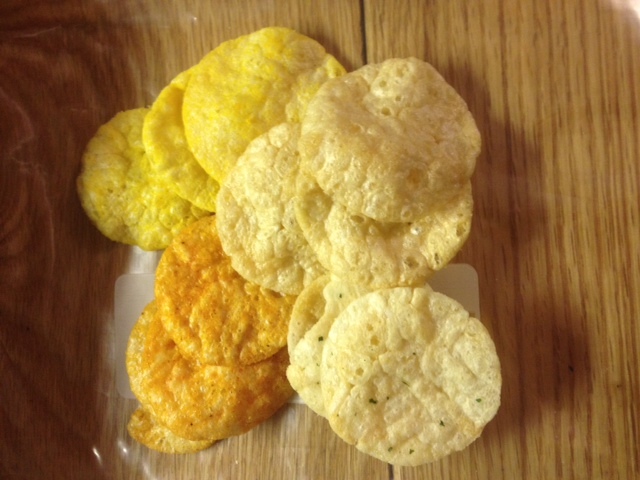 Natural Potato Ingredients (potato flour, potato starch), Safflower Oil and/or Sunflower Oil, Rice Flour, Sea Salt, Soy Lecithin.